Babies grow and learn so much in the first year. So many milestones take place and we want to capture and document these milestones beautifully. Dawn Rocks Photography milestone session style is simple and timeless with props and accessories that are typically neutral, muted, and organic in colors and textures often with a hint of vintage style. We discuss your vision to incorporate that into the sessions. The studio is full of props for styling the sessions including outfits that reflect the DRP style. No need to bring anything unless you would like to incorporate outfits or props/theme of your choosing. Milestone sessions are recommended to focus on stages, not ages. Smiling, sitting, standing/one year. Smiling unusually takes place between 3-5 months once little one can do tummy time and can smile during interactions. Sitting typically takes place once little one can sit mostly unassisted, usually around 6-8 months. A food smash can be done during this session as well if baby has been introduced to baby foods. Standing typically takes place around one year. A cake smash can be done during this session. (Studio does not provide cake or food for the smashes and the style is simple with the baby and the smash as the focus - themed prop set ups for the cake smash can be booked as a custom session). 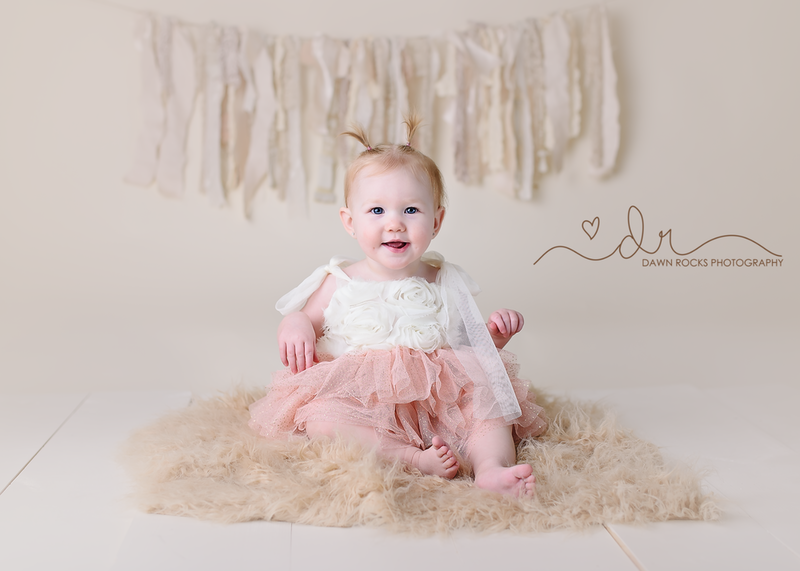 The newborn sessions are held at the DRP studio located in Lakewood, WA. Please use the contact form for our milestone session pricing. DRP offers a baby plan discount and newborn clients receive special discounts on their milestone sessions. Dawn Rocks Photography is a newborn photographer that also specializes in maternity and first year milestones serving the Seattle, Tacoma, Puyallup, JBLM and surrounding areas.